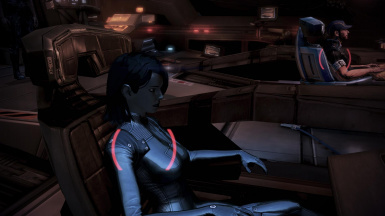 Plug-n-play DLC mod wherein EDI gains a more humanized appearance with this mod, eliminating her VERY artificial default face/head with one that is more human. No more glowing visor, no more helmet instead of hair. She remains synthetic, and clearly so, but it is much less drastic. This mod also smooths out her body curves and armors, eliminates her default robot body for a more human-like uniform. Joker can feel more like he's banging a real female instead of a sexbot. Future tweaks will seek to improve on her synthetic skin appearance.